The Honorable Ambassador Ken Blackwell is currently a Senior Fellow at the Family Research Council, an organization dedicated to advancing faith, family, and freedom in public policy. Ambassador Blackwell has had a prolific political career, most recently serving as Ohio Secretary of State from 1999-2007. He has also served as Ohio State Treasurer, Mayor of Cincinnati, Undersecretary in the United States Department of Housing and Urban Development, and as an Ambassador to the United Nations Human Rights Commission. In 1998 and 2002, Ambassador Blackwell was a delegate to the White House Summit on Retirement Savings. He also served on a congressionally appointed National Commission on Economic Growth and Tax Reform during the 1990s. Ambassador Blackwell has been a fellow at Harvard University’s Institute of Politics, the Aspen Institute, the Salzburg Seminar in Austria and the Johns Hopkins University School of Advanced International Studies (British-American Project). His continuing education has included executive programs at the Massachusetts Institute of Technology and Harvard. Ambassador Blackwell has also received honorary doctoral degrees from 10 institutions of higher education. He holds a Bachelor of Science and a Master of Education from Xavier University (Ohio), where he later served as a vice president and member of its faculty. In 1992, he received Xavier’s Distinguished Alumnus Award. 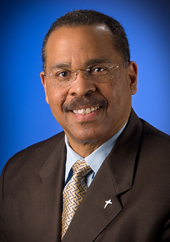 Throughout his career, Ambassador Blackwell has authored three books: Rebuilding America: A Prescription for Creating Strong Families, Building the Wealth of Working People, and Ending Welfare; The Blueprint: Obama’s Plan to Subvert the Constitution and Build an Imperial Presidency; and Resurgent: How Constitutional Conservatism Can Save America.